We recently visited a lovely campsite in North Nottinghamshire and it inspired us to do more caravan trips during the winter months. Initially, we were worried about the weather and thought the kids wouldn’t get to play out very much. And we wondered if winter caravanning would just be way too chilly. But not so. We really enjoy it. It does take a little while to warm up the van, but don’t be disheartened, after a couple of hours we were warm and cosy. 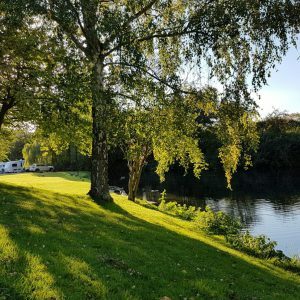 So have a look at our list of family-friendly caravan sites that are open all year round in the Peak District and across the East Midlands. If you have any favourites or know of a gem, please share it and I will add to the list. We recently visited this gem of a site in the beautiful Nottinghamshire countryside. It’s a lovely site, found next to Sherwood Forest and the delightful village of Edwinstowe. You can read all about our visit to Sherwood Forest Holiday Park here. Loads of toilets and shower facilities dotted about the site. WIFI available and an amazing well stocked on-site shop. A beautiful site with a river meandering through it – perfect for dips in the summer (however, our kids were knee deep within minutes despite the temperatures). An attractive family camping and caravan park, in the hamlet of Stragglethorpe, close to Nottingham. Fab for families with cheeky free range hens roaming the site and an indoor swimming pool to keep the kids entertained. Hardstanding pitches and electric hook up. Modern washrooms, clean, bright and warm. Kids can explore the outdoor play areas and copses. And a warm clean pool is always a winner! If you’re a real-ale fan this award-winning park has its own brewery next door, or you can trot down to the local pub The Crown, and sample a few of its real-ale favourites. Over 100 touring pitches on all-weather surfaces and with electric hook up and modern facility blocks. Milestone Park is found on the border of Nottinghamshire, Derbyshire, Lincolnshire and North East Leicestershire and its only 7 miles from the beautiful town of Newark, so lots of places to visit and sites to see. Electric hook up available. Eco-friendly shower block. Dogs allowed but on a lead at all times. Peace. Quiet. Eco-friendly solar-powered facilities. Nestled between Buxton and Bakewell, Beechcroft Farm is a gorgeous family-run caravan park and camping site. It’s a great base for exploring the Peak District. 30 hardstanding pitches that all include 16 amp electric hookups, a water tap and TV socket providing a digital signal. We think the location. It’s close to the Peak District towns of Buxton, Bakewell, Castleton, Matlock, Ashbourne, with Â Chatsworth House, Haddon Hall, Calke Abbey, Hardwick Hall, Lyme Hall and Kedleston Hall all a short drive away. Another site we visited this year and it’s stunning. Beautifully presented with cracking views of the Derbyshire Dales. The kids loved it too, the play areas are great. It’s a perfect spot to get to Matlock and Bakewell. Two fully heated facilities blocks to keep you warm in the winter. Large hard standing pitches with electric hook up. It’s just gorgeous, and the kids play areas are fantastic. Loads of grassy areas to run, ride and have fun. In the heart of the National Forest, this site gets great reviews. It’s perfect for families, walkers and cycling fans. 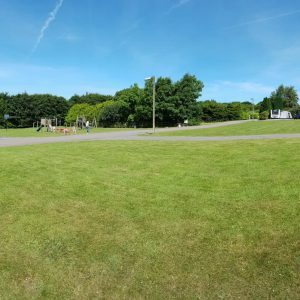 This open all year site has great all-weather facilities, with 100 pitches for caravans and campers, with hardstanding and electric hook up available. It has fab kids facilities and play areas on site. Found next door to CONKERS where you’ll find 120 acres of fun in the forest, assault courses, high ropes, and a discovery centre and themed events. We’ve heard a lot of good things about this site. Opposite, the Silverhill Wood Country Park with direct access to the Teversal Trails and miles of walking and cycling paths. Seriously good facilities. Power showers. Individual bathrooms. There’s even a dog shower. The 126 pitches have grass and hard standing and electric hook up available. Everything on site is exceptional and it’s only a few miles from the Derbyshire Dales and Peak District.